This pub must now be rivalling the Priory Arms as the best pub in South Lambeth. Typical of many of the pubs I visited in this part of London, it has an intentionally worn interior and seems to appeal to the local trendsetters. The bar stocks a good range of ales. There is plenty of seating at the front for drinkers and a dining area at the rear. The dining area looked empty, with most people at the dark front bar to watch the rugby. I preferred the rough and ready interior to the modern feel in the Priory Arms. But I'm not sure the beers were better - Skinners Betty Stogs, Sambrooks Powerhouse Porter, Hogsback Snout & Timothy Taylor Golden Best. Once again, the staff seemed to lack basic customer service skills. Nevertheless, a fairly good pub. I had heard some great reports of this place but the result was a huge disappointment. - the forecast for rain had been clear 5 days beforehand. Plenty of time to get more staff in. - When we reasonably made out various concerns clear to the staff, they made it very obvious they had no interest in our opinions. I will never go back and I would urge anyone in pursuit of good food and polite staff, to do the same. South Lambeth Road is blessed by the positioning of such a wonderful Beer palace as "The Cantons" in it's midst; betwick Old South Lambeth and Stockwell. A clean, friendly, large pub, with good music, good staff, fine food, colourful and charming customers and especially well kept, and presented beer. As a smoker, it's a dream place to sit outside, sup beer and puff on your cigar, whilst watching the world go by; no hassle;happiness. Oft when I'm late in town, I have no problem being served late, with a warm welcome and a friendly smile and comment. I highly recommended it to all. Enjoy! I go there most Monday nights after 5-a-side. 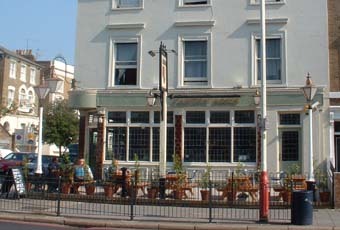 The pub splits into 2, a full blown restaurant and a normal bar and they are quite seperate. Never been in the restaurant but the pub bit is good. Always have four real ales, normally all in good nick. Prices are standard. must be popular as the bar does good business on a Monday. Staff are fine.